This image on the left is Flexible Grill Cleaner removes baked-on grime...no touching greasy grates. 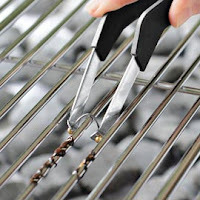 Unlike a brush, this stainless steel wire cleans the grates all the way around, not just on top. Strips away baked-on food with ease, and you don’t have to remove the heavy, greasy grates to clean them. Lightly coat grate with veg. oil prior to cooking will help. Turn on high for 10 mins. after cooking is done. Let grill cool, then use wire brush. If you use straight bbq sauce during cook, then the sugar will be a tough one to clean up, as it will caramelize and burn. Try adding 1 cup beer and 1 cup vinegar to 1 cup of your favorite bbq sauce to make a "mop". No need to put "mop" on chicken halves or qtrs. until it has been on for 45 minutes.